MAJR Products offers a variety of EMI gaskets and tapes, including EMI/ RFI shielding tape, EMI/RFI knitted wire mesh gasketing, strip gasketing, Multicon EMI gasketing, conductive die cut, molded, and O-ring gaskets in a multitude of materials and configurations. Each EMI gasket and tape has attributes that make them attractive for specific environments and applications. Each offers unique possibilities for the attenuation of electromagnetic interference (EMI) and radio frequency (RF) waves. Knitted Wire Mesh EMI Gasket/RFI Shielding Tape (1000 series) is a double-layered strip of knitted wire mesh providing an effective electromagnetic and radio frequency interference shield for electrical and electronic cable assemblies. The knitted construction maximizes conformability and flexibility while minimizing bulk and weight. Knitted mesh shielding tape uses Sn/Cu/Fe knitted or Monel wire to provide good physical strength and shielding effectiveness. Metallized Fabric Shielding EMI Gaskets (1400 series) is a combination of a metallized, woven nylon cover over a foam core – provides superior EMI/RFI shielding. These are available in a variety of profiles, including Asymmetrical, C-Fold, P, and D shapes. Customized profiles and fabricated die-cut parts including I/O shielding for Mil and D-Sub connectors can be manufactured to meet specific requirements with no (or minimal) set-up cost. All Mesh EMI Gaskets/RFI Knitted Wire Gasketing (1500 series) is available in various cross sections to satisfy the many different requirements encountered in EMI/RFI shielding applications. 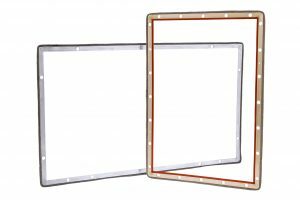 The choice between rectangular, round, round with fin or double round with fin depends on the enclosure or equipment to be shielded. Multicon EMI Gasket Material (1500 series) is a combination of silicone and conductive paths to provide a superior environmental seal as well as EMI/RFI (electromagnetic and radio frequency interference) shielding. The conductive wires are dispersed throughout the width of the material to provide great protection against electromagnetic and radio frequency contamination. EMI Shield Seal Strip Gaskets (1500 series) is a combination of wire mesh and an elastomer to form one product with excellent environmental and EMI/RFI shielding properties. It is used in applications such as electronic cabinets where this type of shielding gasket material is utilized around the doors of the cabinet to seal off stray electromagnetic and radio frequency interference. Wire Mesh Over Elastomer Core EMI Gaskets (1500 series) is a great choice in lower cost effective EMI/RFI shielding and environmental protection. With two covers of mesh over an elastomer, the elastomer under pressure protrudes through the mesh to give sealing protection. EMI Connector Gaskets (2000 series) accomplish the grounding of AN Series, Bendix, and RF-Type connectors to an enclosure bulkhead in a manner that will reduce the ingress or egress of electromagnetic and radio frequency interference (EMI/RFI). We offer hundreds of profiles. Die-Cut, Molded & O-Ring Gaskets (2000 series) provide the flexibility of complete custom design to assist the client in shielding even the most difficult open aperture situations from electromagnetic and radio frequency interference. Quite literally any size, any shape, and material is available. MAJR Products’ fingerstock gaskets are made of Beryllium Copper and are ideal for repeated opening and closing applications where high attenuation performance and mechanical strength is required. EMI Shielding Tape With Conductive Adhesive (2800 series) is an economical electromagnetic interference shielding solution for a variety of commercial uses. The tapes are available in copper, aluminum or tinned copper foil backed with highly conductive pressure sensitive adhesives. Rigid Mounting Frame EMI Gaskets/RFI Shielding Gaskets consist of an aluminum extrusion with a specially designed jaw. When closed, the jaw crimps the fin of the knit wire EMI shielding gasket to form a rigid construction with the EMI shielding gasket held firmly in place. Conductive Silicone, also known as Conductive Elastomer (5000 series) is a molded silicone elastomer filled with conductive inert particles. It provides high electrical conductivity, broadband shielding and moisture sealing. This material is designed to provide reliable and cost-effective shielding for a wide range of EMI applications. Metallized Filled Silicone is manufactured in sheets, molded parts, strips and die-cut gaskets. Form-In-Place Gasketing (8000 series) MAJR Products Form-in-Place automated EMI/RFI gasketing is offered to facilitate the increasing demand for shielding of smaller profile and mechanically tight tolerance areas for a variety of metal and plastic housings. Our software driven automated gasket dispensing system delivers a custom programmed precise bead of conductive silicone, also known as conductive elastomer to narrow flanges or edges as small as 0.030 in (0.762 mm).